The day of October 4 was chosen because on this day the Catholic Church celebrates the feast day of Saint Francis of Assisi, who is venerated as patron saint of animals and the environment. Originally, the celebration focused on raising awareness of the plight of endangered species. It has since expanded its focus to reflecting on all the animals in the world and showing our respect and love for them. The concept of World Animal Day is promoted by a team of Ambassadors in many countries. 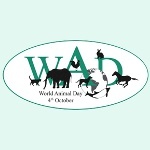 World Animal Day events are aimed at raising the status of animals in order to advance animal welfare standards. They are held by animal welfare organizations, community groups, and individuals from all over the world. These events include (but are not limited to) workshops, conferences, fundraising events, educational and awareness events, peaceful protests, sterilization and vaccination campaigns, animal-related school events, veterinary treatment camps, etc.